Does Anyone Care About the Breakdown in Financials? On some levels, this is a good thing. Market cap of banks relative to the rest of the economy had run a little hot in 2007 when they were leveraged to the teeth with triple-A products (thanks $MCO!). So as Howard Lindzon points out, it's nice to have the market make sense. But you really can't have a solid bull market without a full participation in multiple sectors. Sure, leading stocks will lead but you can still have the averages dragged down-- if you compare a chart of $QQQ and $SPY on a weekly basis you'll see how the financial component in the S&P isn't so nice. So $XLF, the SPDR financial sector fund, is breaching its most recent lows in the market. Names like $JPM, $GS, $MS, and $BAC are all showing signs of technical weakness. 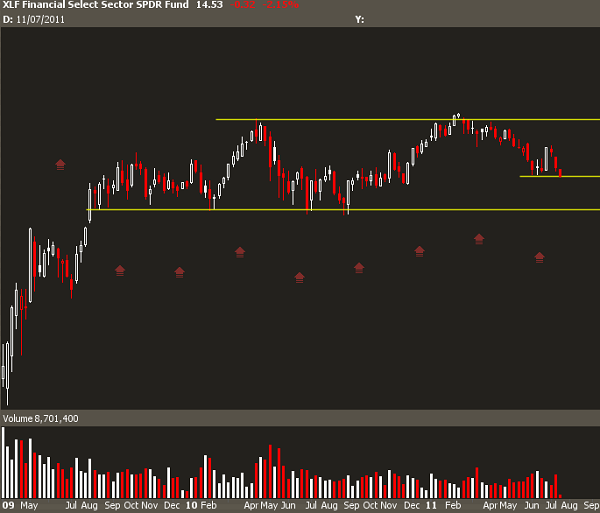 The chart above shows a weekly chart of the $XLF. Note that we really haven't breached above 2010 highs, and given the course of this range, I'd consider this a cyclical bear market that has diverged from the rest of the market. But what's the underlying psychology going on here? Is there really any fear in the market right now? We can use the $VIX to see option demand in the $SPY, but for just the financials, we'll take a look at the $XLF options board to get an idea of the expectations. Below is a chart of the 30 and 60 day implied volatility in XLF options over the past 2 years. And if you don't know what implied volatility means, I can help. So compared to the past few months, we're certainly at the top of our range, and we could make the case that premium selling in this environment would be a reasonable bet. However, if we compare it to last summer when the Euro Voodoo really caught on, the premium in these options were much, much higher. So what's the trade? 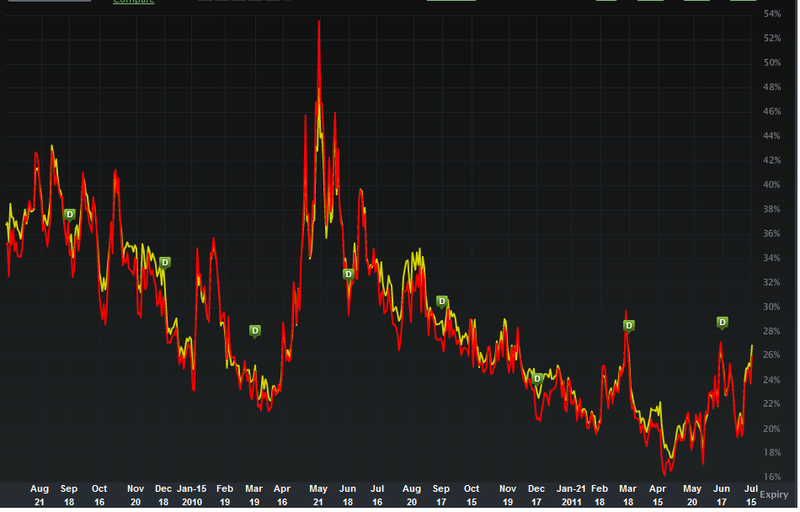 I'm inclined to sell volatility, but not in size here. Things that are ugly could get uglier, and there's plenty of leading names out there to chase. But if we do get a good old fashioned panic, I'll be looking pick up some bull put spreads into the blood.